 A childrens favourite  as bean bags just mould to the shape of the body for comfortable seating. 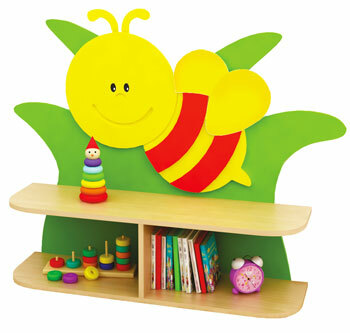  Available in a choice of 6 attractive colours  red, yellow, blue, green, orange and pink. 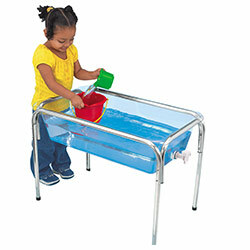  Moisture resistant and easy to clean.  Easy to wipe clean.  Made from pvc and polystyrene filling. 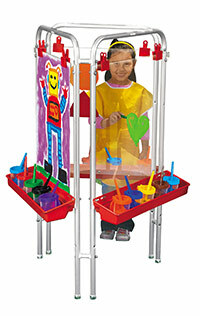  Suitable for children aged 1-10 years.  Dimensions per bean bag: (HxD) 920 x 750mm. 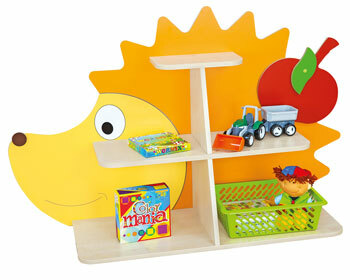 The Mini Fruit & Veg stool sets are printed with the names of each of the fruit or vegetable in English, French and Spanish to introduce languages into the classroom whilst encouraging children to learn about the food they eat. Fabrics are certified to the British Standards for soft furnishing fire retardancy, as is the polystyrene bead filling - Flame retardant, Water resistant - Tamper resistant zip closure mechanism to make sure that the bean filling stays where it should be - Inside the bean bag and not all over your floor. 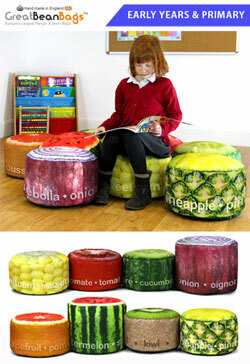 Story Time Fruit & Veg stool sets include one adult sized bean bag so Teachers can join in too! The perfect combination of comfortable learning and teaching. 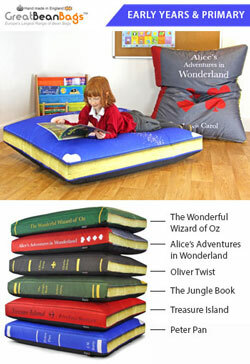 We know bigger isnt always better, but when it comes to our Classic Primary Book Bean Bags, that is the case. 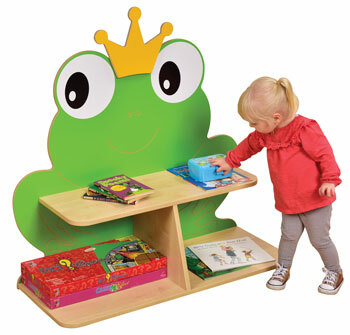 The perfect addition for any reading corner or library your students will adore sitting on these super comfy childrens book classics. Our three piece Primary Maths Cubes set is a brilliant tool to make mathematics fun and engaging for young minds. The Mini Armchair is both structured and supportive, yet still really soft and comfortable. 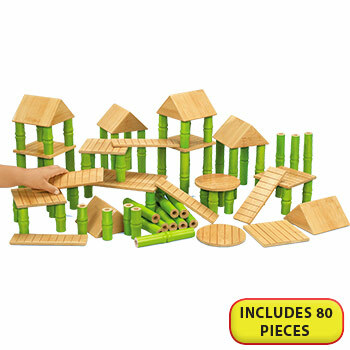 Brilliant for any nursery environment and great to take outside on warmer days. 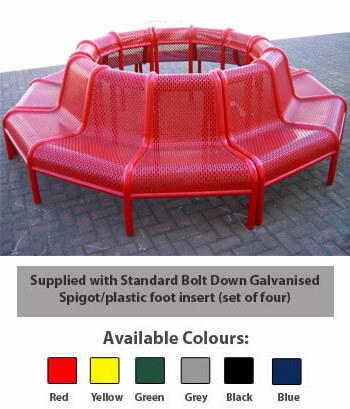  Available in a range of vibrant colours - suitable for indoor and outdoor use. 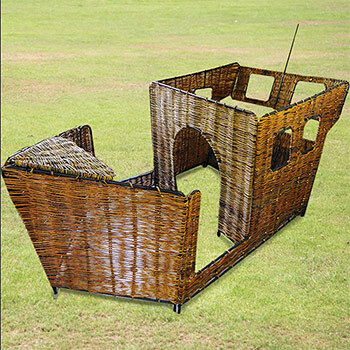  Available in three quantity packs: can be supplied as an individual mini armchair, a pack of 6 or a pack of 9. Available in two materials: Indoor/Outdoor (woven polyester ideal for lounging in gardens or living rooms) or Faux Leather (an ideal alternative to leather). The Indoor / Outdoor fabric is shower proof and UV resistant, meaning the sun and rain will not damage bean bags made in this material. 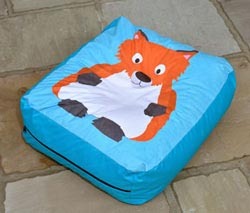 However, these bean bags are not full waterproof and should not be left uncovered if raining. Brighten up even the dullest of rooms with our Animal Bean Bag Collection. 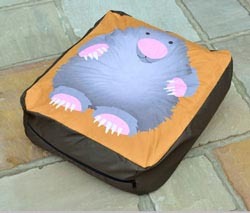 Ideal for stimulating young minds, all of the Animal Collection Bean Bags make fantastic decorative pieces or used in a more tradional way, a BIG comfy seat! 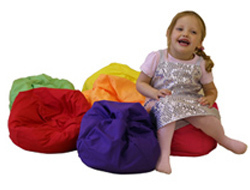  This colourful and comfortable range of bean bags are incredibly ideal for pre-school and primary environments.  Perfect for creating quiet zones in classrooms, reading areas and libraries.  Combine bean bags with students and you have comfortable, productive learning.  Available in a range of vibrant colours.  Available in four quantity packs: can be supplied as an individual bean bag, a pack of 6, a pack of 10 or a pack of 30 bean bags.  Dimensions per bean bag: 500mm diameter. 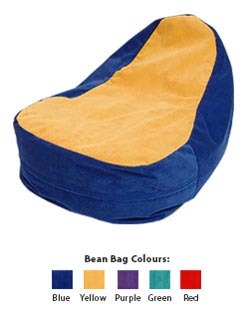  This colourful and comfortable bean bag chair is perfect for reading corners.  Available in three quantity packs: an individual chair, a pack of 4 or a pack of 6 chairs.  Dimensions per seat: (HxW) 700 x 700mm.  A perfectly styled variation on the bean bag chair, this seat adds extra comfort for little bookworms looking to escape into their favourite story.  Ideal for mixing up relaxation and reading areas.  Available in three quantity packs: an individual seat, a pack of 4 or a pack of 6 seats. 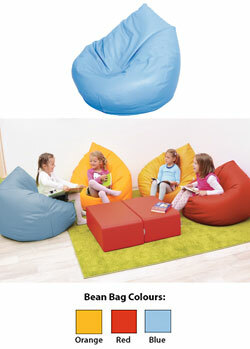  A highly popular style of bean bag seating to use for group interaction within classrooms and library areas.  This bean bag stool is easy to stack away and move around.  Available in three quantity packs: an individual stool, a pack of 3 or a pack of 5 stools.  Dimensions per seat: 500 x 400mm. 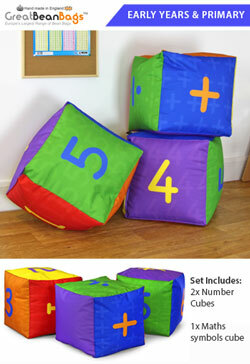  Creative cube bean bags are a great way to add a splash of fun into the classroom.  These bean bag cubes are extremely popular as they are stackable, comfortable and the perfect size for primary children. 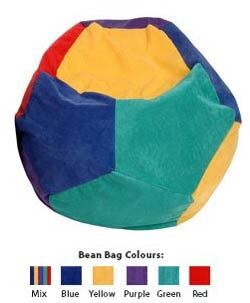  Combine cube bean bags with students and you have comfortable, productive learning.  Available in three quantity packs: an individual cubes, a pack of 3 or a pack of 5 cubes.  Dimensions per seat: 400 x 400 x 400mm.  A functionally shaped bean bag which can be configured for efficient use of any space.  Available in three quantity packs: an individual square, a pack of 4 or a pack of 6 squares.  Dimensions per seat: 700 x 700mm.  A multi use bean bag which is a must have for any school.  Can be used as a large floor cushion. Turn it on its side and the slab becomes a hammock seat or prop against the wall and you have an extra comfy chair.  This bean bag slab is easy to stack away and move around.  Available in three quantity packs: an individual slab, a pack of 4 or a pack of 6 slabs.  Dimensions per seat: 1250 x 1000mm.  Back by popular demand, this settee is one of the best bean bags for students to interact on. 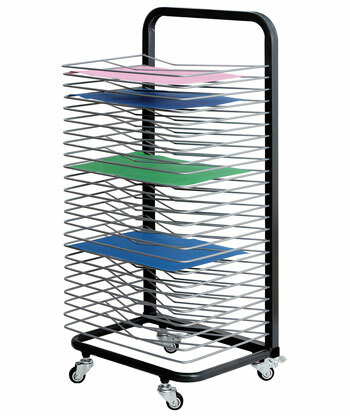  A highly comfortable piece of seating that can help group work and assisted learning.  This bean bag settee is easy to stack away and move around.  Available in three quantity packs: an individual settee, a pack of 2 or a pack of 6 settees.  Dimensions per settee: 1250 x 900mm.  As a plump floor cushion, place this bean bag in a large circle and you have the tools and full classroom participation.  This bean bag circle is easy to stack away and move around.  Available in three quantity packs: an individual circle, a pack of 4 or a pack of 6 circles.  Dimensions per circle: 700mm diameter.  This set includes 6 Primary Bean Bag Chairs and 6 Primary Bean Bag Slabs. 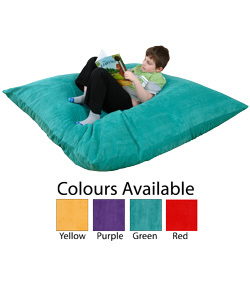  The colourful and comfortable bean bag chair is perfect for reading corners. This supportive bean bag is exciting enough to make even the most reluctant reader pick up a book.  The slab is a multi-use bean bag. It can be used as a large floor cushion. Turn it on its side and the slab becomes a hammock seat or prop against the wall and you have an extra comfy chair.  Dimensions per chair: 700 x 700mm.  Dimensions per slab: 1250 x 1000mm.  This set includes 12 bean bag seats.  A perfectly styled variation on the bean bag chair, these seats add extra comfort for little bookworms looking to escape into their favourite story.  This set includes 6 Primary Bean Bag Chairs, 6 Primary Bean Bag Slabs and 6 Primary Bean Bag Circles.  As a plump floor cushion, place the circle bean bag in a large circle and you have the tools and full classroom participation.  This set includes 5 bean bag stools.  These bean bag stools are easy to stack away and move around.  Dimensions per stool: 500 x 400mm.  This set includes 6 Primary Settees.  This set includes 2 Primary Bean Bag Chairs, 2 Primary Bean Bag Slabs and 4 Primary Bean Bag Stool. 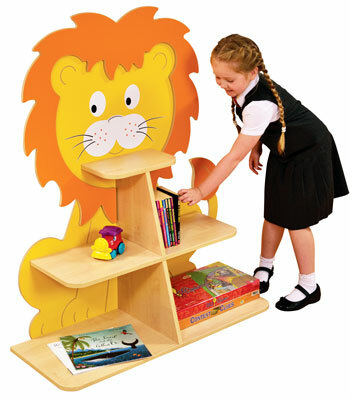  An ideal mix to kit out classrooms, libraries and common areas.  The colourful and comfortable bean bag chair is perfect for reading corners.  The bean bag slab is easy to stack away and move around.  As a multi-use bean bag, the slab be used as a large floor cushion. Alternatively, turn it on its side and the slab becomes a hammock seat or prop against the wall and you have an extra comfy chair.  The bean bag stool is easy to stack away and move around.It is a highly popular style of bean bag seating to use for group interaction within classrooms and library areas.  All available in a range of vibrant colours. 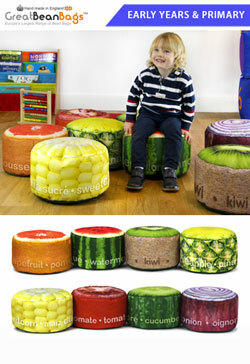  This set includes 4 Primary Bean Bag Cubes and 4 Primary Bean Bag Stools. 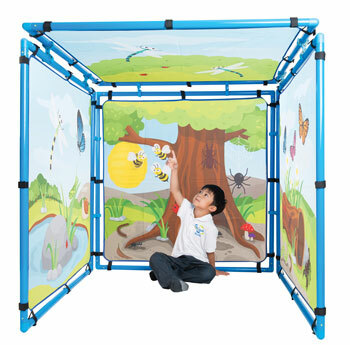  The bean bag cube is a comfortable and creative way to add a splash of fun into the classroom.  Dimensions per cube: 400 x 400 x 400mm.  This set includes 2 Primary Bean Bag Chairs, 1 Primary Bean Bag Bench and 2 Primary Bean Bag Seats.  An ideal mix to kit out libraries.  The bean bag bench has a firmer feel and is designed to be functional and space efficient.  A perfectly styled variation on the bean bag chair, the seats add extra comfort for little bookworms looking to escape into their favourite story. 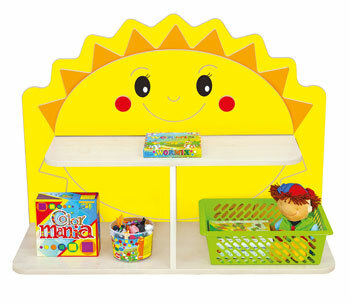  Dimensions per bench: 1000 x 800mm.  This set includes 6 Primary Bean Bag Chairs, 6 Primary Bean Bag Slabs, 6 Primary Bean Bag Stools and 2 Primary Bean Bag Settees.  The bean bag settee is a highly comfortable piece of seating that can help group work and assisted learning.  Excellent for seating or as a sleep bed.  Made to exacting quality standards and finished in a soft touch durable vinyl, meeting U.K. safety and fire standards.  90cm diameter x 10cm.  Made to your order - please allow up to 4 weeks for delivery. 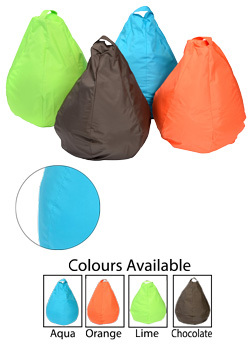  Set of 6, brightly coloured mini sag bags just like our otherbeanbags, but smaller. 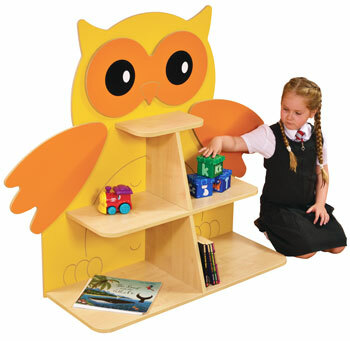  Ideal for pre-school and smaller children who need good supportive seating.  Free delivery on eveyrthing.  The huge bean bag can be used outside.  Even a teacher or a small group can sit comfortably on this cushion as it allows all sorts of positioning as a chair, a bed, a corner seat, etc.  The bean bag cover is wipe clean and hard wearing. 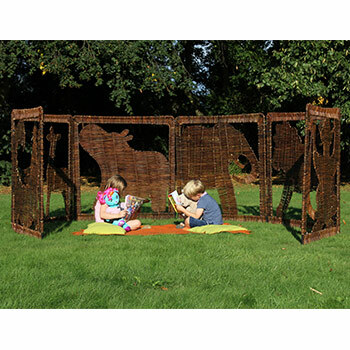  Although it can be used outside it is not designed to be left outside on a permanent basis. 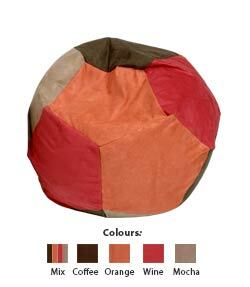  A comfortable and vibrant outdoor bean bag perfect for use outside or colourful indoor bean bag seating.  British designed with quality workmanship.  Easy wipe clean fabric, just sponge clean with warm soapy water or remove and wash at 40°C. 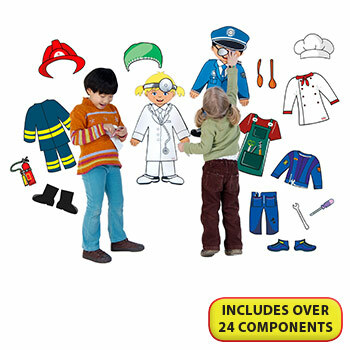  Manufactured in top quality outdoor grade nylon and polyester fabrics which are strong and durable.  Lined with a 2oz nylon inter liner for security of the beans.  Dimensions: 600 x 500 x 500mm. 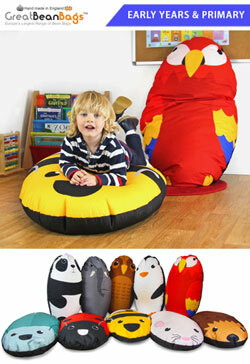  Truly enormous bean bag cushions made from new jumbo cord and available in 4 colours. 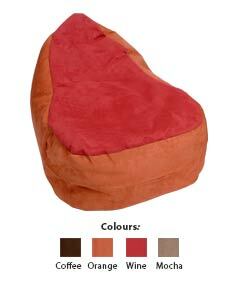  Ideal for individual use but also large enough to fit several students, they can be used as a bean-bag, lounger or floor cushion.  The cushions have an interliner so that the covers can be removed and washed at 30ºC.  Made from jumbo cord.  Colours available: yellow, purple, green and red.  Dimensions: 1400 x 1400mm. 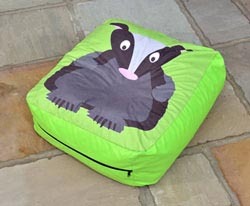  Fantastic woodland creature outdoor bean cushion perfect for use outside or colourful indoor bean bag seating.  Dimensions 700 x 600mm. 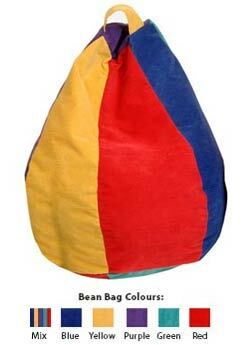  Brightly coloured bean bags are gently shaped to provide back support.  Available in a range of colours: blue, yellow, purple, green and red. 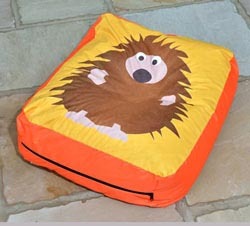  Our bean bags are fully lined so that the outer cover can be removed for cleaning.  Middle colour is yellow cord.  Dimensions: 550 x 550 x 720mm.  Cord coloured bean bags.  Comfortable and easy to clean. 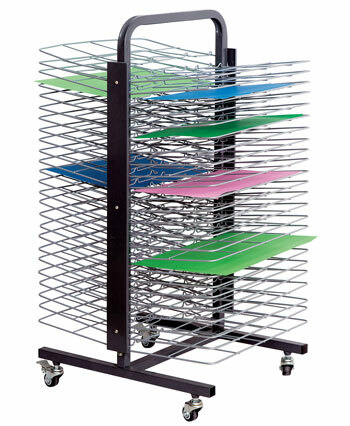  Available in a range of colours: mix, blue, yellow, purple, green and red.  Dimensions 600 x 500 x 500mm.  Dimensions 600 x 600 x 600mm.  Suede coloured bean bags.  Gently shaped to provide back support.  Available in a choice of 4 solid colours (Coffee, Orange, Wine, and Mocha). 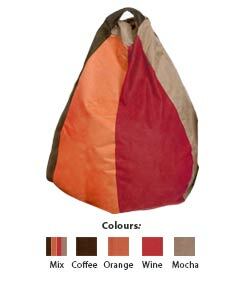  Available in a choice of 4 solid colours (Coffee, Orange, Wine, and Mocha) and 1 mix colours.  Dimensions: 600 x 600 x 600mm.